Summertime care free living is here. It usually means more people, more bar-be-ques, more fun in your pool, and of course more laundry and dishes! So how do you save water during the summer? See our tips below for some ways to conserve water. Summer might be the season for increased rain, but with scorching temperatures, we might also need to water our lawns a bit more, so check those sprinklers for leaks. Between kids playing, and regular lawn maintenance, it’s easy for a sprinkler head to get broken. Water your lawns and gardens either early in the morning or later in the evening when most of the water won’t evaporate. And if your system is set to a timer, think about installing a rain sensor so it’ll shut down in the event of a rain storm. Most of us in the Bradenton Sarasota area have backyard pools. With the summer heat, comes pool parties and in general just more people in the pool, which ultimately means more laundry with all those towels. Take a few extra minutes to inspect the washer hoses. Make sure they aren’t leaking or cracked. This is even more important if they’re rubber hoses. If they are damaged, have them replaced by a plumbing professional. 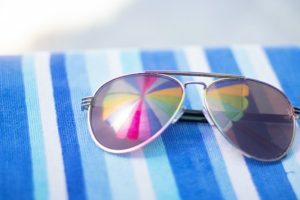 If you’re going on vacation, which many of us do during the summer, or here, we even leave during the summer months all together, turn off or adjust the temperature of your water heater. You won’t be here, so why pay to heat it? Most if not many water heaters today have a “vacation” setting, and if not, they can be turned completely off. Even if you’re home, more likely than not, in southern Florida during the summer you’re not going to want a super-hot shower, so the temperature can be turned down a few degrees anyway. Conserve water this summer while still staying cool! When you need a plumber, you need Wyman Plumbing! Contact us today!